RebateBlast at Blitz Your Way to Big Game Savings! 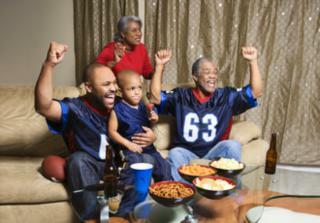 Super Bowl XLVIII is heading to MetLife® Stadium for an exciting game! The Seattle Seahawks and Denver Broncos will showcase top-ranked defense against leading offense, making this matchup a must-see! While these two top-seeded teams battle it out on the field, fans will be reveling in one of the biggest parties of the year! Whether enjoying it in person or with friends at home, don’t wait another second to start planning! If you want to be part of this historic football frenzy live and in person, Super Bowl tickets are on sale now. Make your arrangements quickly and conveniently all from one place at Ticket Liquidator®. Get tickets for the game and parties, as well as book hotel reservations with package deals and discounts for all the action! No real football fan would be caught dead without sporting their team jersey. Be the prime receiver of this year’s Game Day gear from Champs Sports®! Order through RebateBlast and save $25 off your order with a promotion code. This deal is only good through 1/31/14, so catch it now! The Big Game demands a big screen. For the TV of your dreams shop Samsung® and for a limited time enjoy Free Shipping on any TV no matter what the size or weight! Bring the game to life with life-size NFL wall decals of your favorite team players from Fathead®. And stock up on Super Bowl party supplies from Windy City Novelties® for a guaranteed 120% that it’s the lowest price with Free Shipping! When it comes to food, it’s all about quantity. Keep the menu easy with foods you can prepare in advance. Start with plenty of crowd-pleasing, great-tasting snacks. Check out The Popcorn Factory® that’s sporting decorative tins with your favorite team logos on the outside and delicious varieties of popcorn flavors inside. Then heat up game time by serving a pot of hot chili with tortilla chips, warm and tasty cheese dip, or spicy chicken wings all from an NFL-Branded Crock-Pot®. Along with the popular Super Bowl Square betting pool, add a little pre-game excitement by handing out trivia Super Bowl quiz cards to all the party-goers. Have them answer questions, such as which team has won the most Super Bowl games, which one has lost the most, who the MVP was last Super Bowl, and the like. Then name the highest scorer as MVP (Most Valuable Partier) at half-time! For more Super Bowl discounts visit our Big Game boutique for coupon codes and 2X cash back rebates on all your Super Bowl XLVIII purchases. Good times, great deals – only at RebateBlast!